I have a friend who is a geologist. Angela knows a lot about rocks. I am a freelance writer. I know very little about rocks. (I make up for my lack of depth with frustratingly wide breadth: jack of all trades, master of none, as they say.) What I know about rocks comes mostly from trying to understand geology on a larger scale for a travel guide I was writing. Researching about Colorado I picked up a copy of Messages in Stone: Colorado’s Colorful Geology, and I learned quite a bit. I actually learned more than I can remember. And none that I can remember is helpful to me when I am out scouting for rocks with Gracie. When we head outside with our kids, I am often scrounging for things for them to study. When birds are scarce, or the sky cloudless, I look down and start pointing out interesting rocks. Grace loves this, but I quickly find I’ve run out of wisdom to share about rocks. It’s fine now. The kids are young enough that just noticing they’re there is enough. But pretty soon I will have to start bringing the goods. So I decided to bone up on rocks and rock collecting, and here is what I’ve learned. First thing you need to do when you find a rock is to identify it. A rock collecting guide is a good start. A decent guide (try to find one appropriate to your specific region) will help you dig down, but identification begins with these three primary classifications. Igneous�� These are the dragon stones, born of fire. They are formed from cooled lava. Granite is the prime example. Sedimentary�� I like to think of these rocks as the couch potatoes of the rock world. They are formed by the settling of material, often underwater. Living near the Great Lakes, it’s easy to visualize the process. Sands settle at the bottom of the lakes. Animals, fish, plants die and settle into the sand. A few thousand years later you have sandstone chock full of little fossils. Metamorphic � These rocks began as sedimentary or igneous, but something happened. Life wasn’t kind, and they got an advanced degree from the school of hard rocks [*chuckle*]. There was a lot of pressure, got too close to the fire, and they came out a little mixed up. In the end, they made something of themselves. Some, like marble, turned out good enough for the finest kitchen counters. Fossil-y � Okay, this isn’t a real term. In fact rocks with fossils in them are always sedimentary rocks. But here in Michigan we have the Petoskey stone, and it deserves a category of its own. Formed of fossilized coral from an ancient inland sea, they’re favorites with kids all over the mitten. 2. Beyond the basics: What about gems and minerals? Feldspar and quartz are the most common minerals. They can be found in all three types of rock. Quartz-lined geodes are a favorite with kids, and you’ll find un-cracked specimens at rock shops all over. Here in the northern Midwest, the iron-stained Lake Superior agate is a coveted find. In fact, it’s the state gemstone for Minnesota. Ask any devoted rock collector, and they’ll tell you they find rocks everywhere. It’s all about looking. But if you’re making an event of it with kids, make it something fun. Beaches are a favorite with our family. 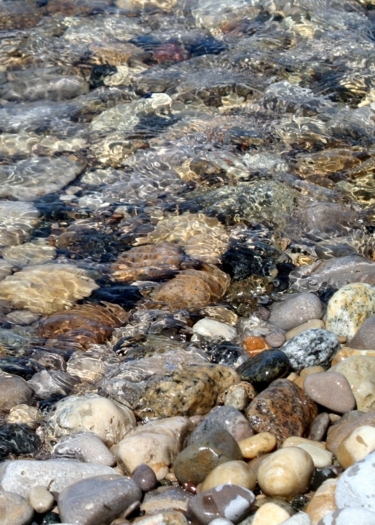 Find a rocky shore where the waves are wetting a line of rocks, and half the work is done for you. Rocks look best when they’re wet or polished. Hobby shops have cheap rock polishing kits. They are essentially a barrel that you fill with rocks and sand. You rotate the barrel over and over until the sand rubs the stones smooth. Or you could take a rock polishing class. I did when I was in middle school. Once a week we kids were taught the fine art of polishing stones. For rocks that simply look good wet, try applying a coat of clear nail polish. As kids we used to do this with the Petoskey stones we found. Some my daughter’s favorite finds when we scour the beach are a) unidentifiable to our amateur eyes, but awful pretty, b) sometimes flat and round and quickly skipped out into open water, and c) often times not rocks at all. One time we spent an hour kicking rocks aside to find sticks to float. Another time we found beach glass. Another time it was these tiny shells that make a great necklace when all strung together on a string. 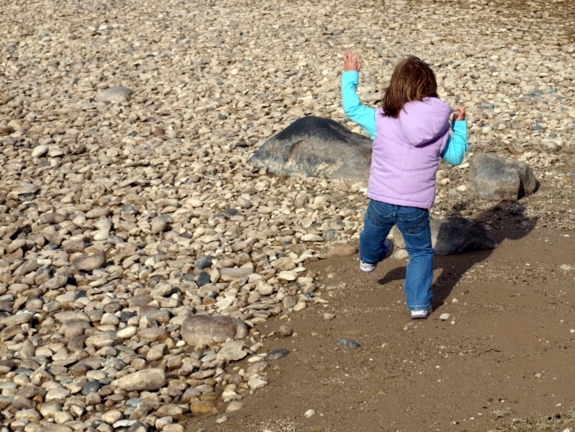 The point is that rock collecting, especially for younger kids, is more about hanging out with Mom and Dad (or Grandma and Grandpa). It’s about having fun, enjoying nature, and being outside.